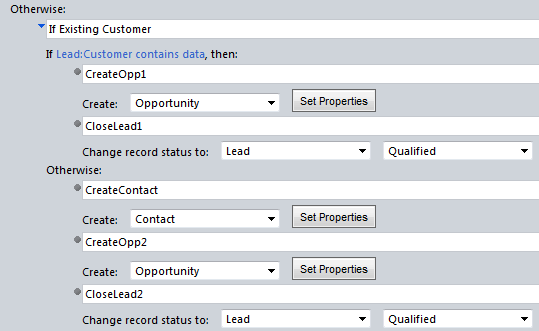 In this post I demonstrate how you can rapidly extend Microsoft CRM with custom screens in minutes, rather than hours or days. I will demonstrate a custom Lead Qualification screen by using a custom Ribbon button that pops a CRM Dialog and I will share a couple of tweaks that smarten up the user experience. However, this screen sits outside CRM’s supported extensibility model and sometimes fails to meet requirements. When you hit this scenario you can attempt an unsupported customisation to the screen, you can build a replacement screen, you can use form fields and plug-ins to manage the requirement or you can use a Dialog. In this post I will demonstrate the Dialog solution and provide some guidance on how you can improve the user experience. Here’s my scenario. I have Leads for both existing Customers (Contacts) and for non-customers. 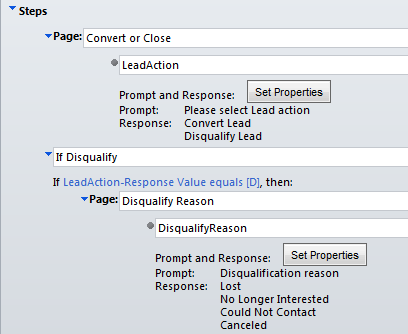 I want users to be able to qualify or disqualify leads. When they qualify them I want the system to create an Opportunity against a Contact record. 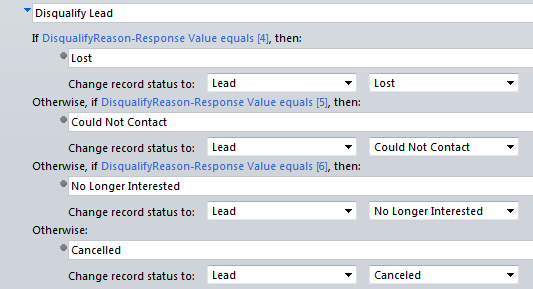 For non-customer Leads, the Contact record should be auto-created. 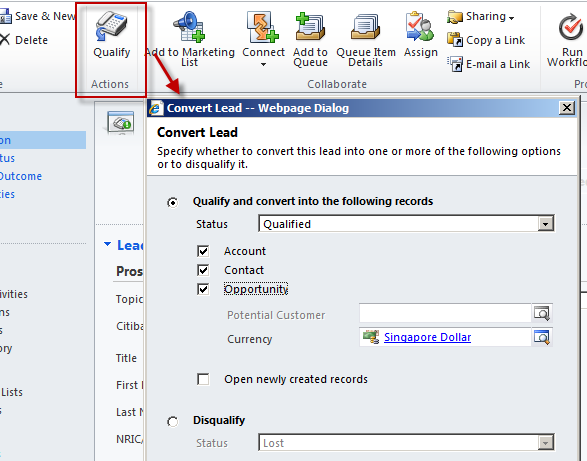 If the user selects “Convert Lead” an Opportunity is created, the Lead status is updated and the Lead form is refreshed. If the Lead referenced an existing Contact then the Opportunity will be attached to that Contact, otherwise a new Contact is created. 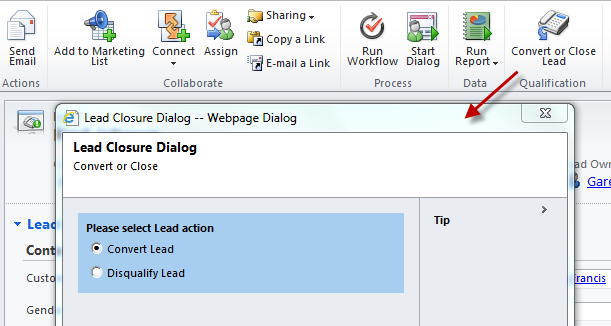 If the user select “Disqualify Lead” the Dialog will prompt them for a reason and then update and close the Lead and refresh the Lead form. The advantage with this approach is it is a more controlled user experience. We are not exposing the user to options we don’t want them to select and not asking them to perform any double keying. And by creating a ribbon button and adding some jscript to auto-refresh the CRM form we get a much nicer user experience then an out-of-the-box Dialog experience. Next, the Dialog needs to take action. I needed to pass the Lead record’s GUID to my function so you will see I registered a CrmParameter in my ribbon definition. “PrimaryItemIds” will give you the GUID of the current record. This function receives the Lead record’s GUID as a parameter (thanks to the ribbon definition) and combines that with the CRM Server URL (which is derived via Xrm.Page.context) and with the GUID of the Dialog definition (which is hardcoded) and then pops that URL. It uses window.showModalDialog() and window.location.reload(true) to automatically refresh the Lead form when the Dialog closes. Now I have hardcoded the GUID of the Dialog in my function. A better solution would be to have that housed as a parameter and read at runtime. Check out this post for an approach you can follow to implement that. That’s it, I hope someone finds this useful. This entry was posted in Uncategorized and tagged crm, dialog on April 3, 2012 by Gareth Tucker. First, thank you very much for publishing this post, it is very useful. instead of using hard-coded entity name and dialog GUID i suggest to pass them as parameters. i’m adding two additional parameters. Thats all, in this way i can reuse the webresource.